The garlic bed was prepared for the 2017\2018 season to be planted in October. The selected area is rototilled and the rows are marked with boards. The whole area is covered with wood chip mulch and sprinkled with some 20 20 20 pellet fertilizer. When the garlic cloves are planted in October the board is flipped up and the clove placed in the ground and mulch is placed over the row. In the Spring when the cloves start growing they have no difficulty pushing through the mulch. The mulch is sufficient to keep moisture and the bed needs no care until harvest in July of 2018. There are 12 rows 8 feet long sufficient for about 16 cloves per row. Spacing is about six inches in the row. 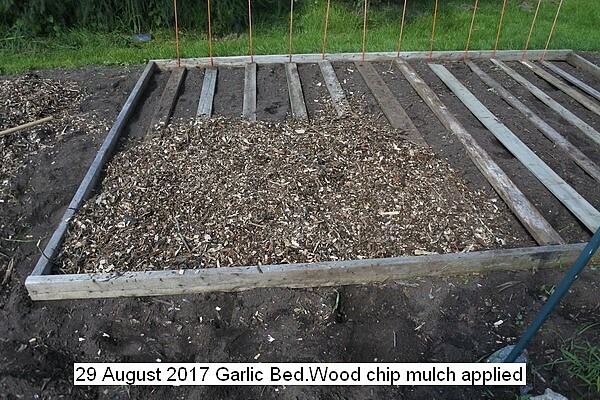 This entry was posted in Uncategorized and tagged 29 August 2017 Garlic Bed, Garlic Bed, Garlic Bed Preparation. Bookmark the permalink.